As the Director of Archives at the Archdiocese of Toronto I am often complimented on the consistently fabulous posts of The Archivist's Pencil. I am always quick to point out that I myself have written very few and the accolades for these wonderfully composed pieces must go to my colleagues. I thought it might be nice to give them a little break every now and again and share with our readers some of my favourite things in our holdings. My first post in the Director's Cut series features an artifact and its corresponding documentation... an archivist's dream! When I began working here I quickly learned that I needed to educate myself on the Second Vatican Council, which is often referred to as Vatican II. Although I was vaguely aware that changes to the way Mass was celebrated had been made at some point in my parents' lifetime, my studies of history hadn't delved much into the post-World War II era, so I was largely ignorant of this major event in the history of the Catholic Church and needed to know more about it to understand the context of a large number of the records in our holdings. If you too would like to educate yourself, you can start with the documents of the Second Vatican Council which can be viewed on the Vatican's website here. October 28 marks the 60th Anniversary of the election of St. John XXIII as Pope. His Holiness announced very early in his papacy that he intended to convene the Ecumenical Council. Several of the former, current and future auxiliary bishops, archbishops and cardinals that served the Archdiocese of Toronto attended sessions of the Council. Listed among the Council Fathers are: Auxiliary Bishop Francis Allen, G. Emmett Cardinal Carter, Auxiliary Bishop Marrocco, James Cardinal McGuigan, Archbishop Philip Pocock and Auxiliary Bishop Benjamin Webster. You can view a full list of bishops who attended each of the four sessions here. At the closing of the Second Ecumenical Council in December 1965, St. Paul VI gifted each of the Council Fathers a commemorative certificate and gold ring. The Vatican II Council ring is made entirely of yellow gold. The ring shaped like a mitre (bishop's hat) with a point at the top. Depicted are three arched niches: Christ in the centre; St. Peter on the left; St. Paul on the right. The artist’s signature is inscribed, “E. Manfrini”. St. Paul VI’s coat of arms in stamped on the inverse of the band. Accompanying the ring was this commemorative certificate from Pope Paul VI. It attests in Latin to Archbishop Pocock's participation at Vatican II and expresses the hope that the message of the Second Vatican Council will be conveyed to all Catholics. We have similar certificates in our collection for Auxiliary Bishop Francis Allen (AF.135a), G. Emmett Cardinal Carter (AF.009) and James Cardinal McGuigan (AF.135b). Cardinal Carter wore his Vatican II Council ring (AF.361) as his regular day-to-day episcopal ring. His Eminence's ring in on display at the G. Emmett Cardinal Carter Library at King's University College in London, Ontario where it is on permanent loan. Toronto's municipal elections are coming up on Monday, and we thought we'd look to see what Toronto's mayors had written to Toronto's bishops. 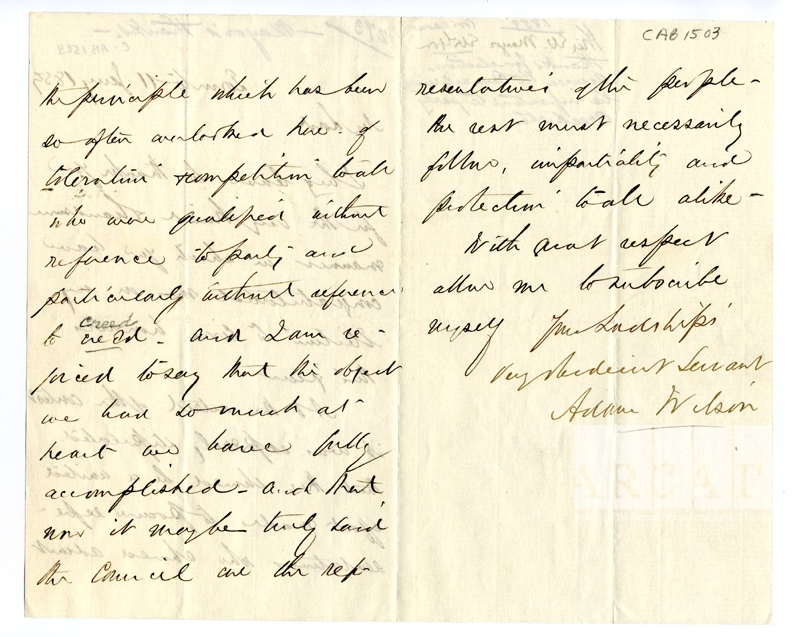 We found a nice letter to Bishop de Charbonnel from 15th mayor Sir Adam Wilson, who took office in 1859. Toronto's first mayor, William Lyon Mackenzie, was appointed in 1834 when the city was incorporated. Wilson was Toronto's first mayor elected by popular vote. Prior to that, citizens in each ward voted for aldermen, who then chose a mayor from their group. From 1859 to 1867 and from 1874 onwards the public voted directly for the city leader. 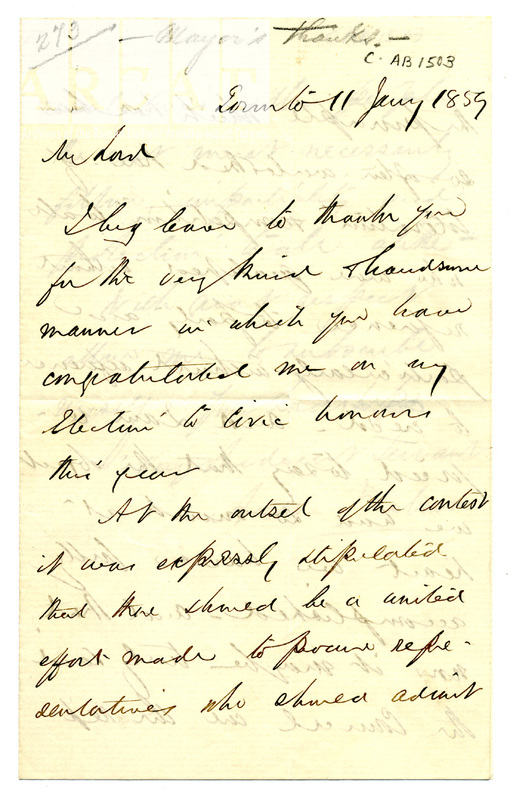 "I beg leave to thank you for the very kind & handsome manner in which you have congratulated me on my election to civic honours this year. Wilson was proud that his council was "of the people." After he was declared mayor, he said, "[I acknowledge] the electors for the very large majority which they [have] given me." Voters in his time were male landholders, but a lot more people are eligible now. If you're one of them, make sure you get out there! It's the best way to make sure that the mayor and his council truly represent the citizens of the city. Every year, the month of October is dedicated to the Rosary. The origins of this go back to at least 1571, when Pope Pius V called for all of Europe to pray the rosary for victory at the Battle of Lepanto. The Christian victory at Lepanto was celebrated as the feast of Our Lady of Victory (now Our Lady of the Rosary) on October 7. Rosary beads are traditionally divided into five groups of ten beads, called decades. There is a prayer to be recited for each bead and a mystery of Christ’s life that is to be contemplated for each decade. The repetition of prayers assists in entering a state of prayerful meditation. Rosary beads come in all shapes, sizes and colours. 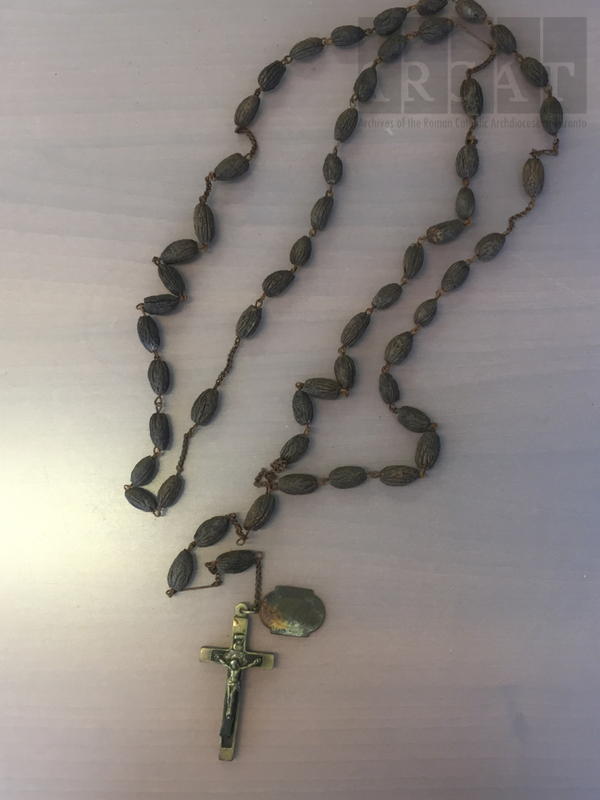 This week, we thought we would showcase a couple of interesting Rosary beads from our collection. 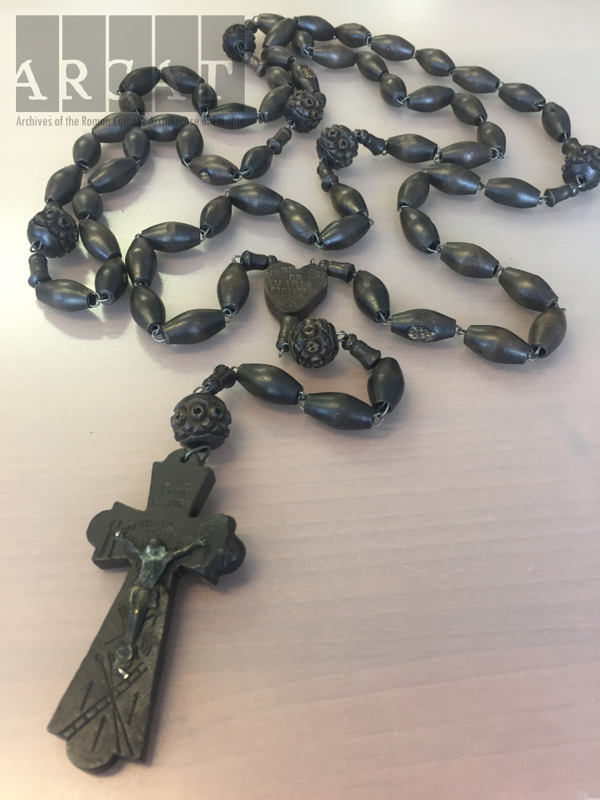 This five decade Rosary is unlike any we've seen before: the beads are made from the pits of nuts. This Rosary is unusal for its size and the fact that is has six decades. The six decade Rosary is of the Brigittine tradition and has a slightly different structure to its prayer. You can find out more about how to pray the Rosary here. And nothing - we mean nothing - warms our hearts like a punny title. 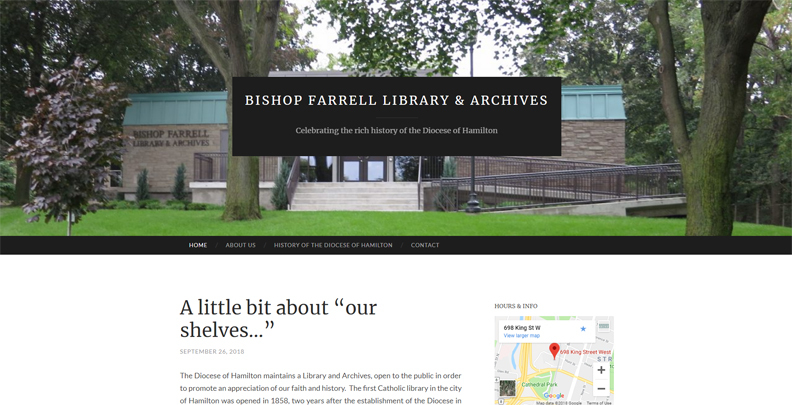 Congratulations to the team at the Bishop Farrell Library & Archives! We look forward to following you. It's been five years since this impressive repository opened its renovated facilities next to Cathedral Basilica of Christ the King. It's worth a visit - both online and on-site. Toronto and Hamilton dioceses have a special relationship, being part of the same ecclesiastical province. In the Catholic Church, a province consists of a metropolitan archdiocese and one or more suffragan dioceses headed by diocesan bishops. Toronto is the metropolitan see of the ecclesiastical province of the Archdiocese of Toronto, which is why our ordinary is called an archbishop. Hamilton, along with London, St. Catharines and Thunder Bay are the suffragan dioceses. The insignia of a metropolitan archbishop is the pallium. Dioceses comprising a province are usually close geographically, often ceding territory to each other as new dioceses are erected and elevated. The Diocese of Toronto was created by the division of the Diocese of Kingston in 1841. Toronto was divided in 1856 by the erection of the dioceses of Hamilton and London, and again in 1958 with the created of the Diocese of St. Catharines. Boundaries of the See of Toronto over time. Graphic created for the 175th anniversary of the Archdiocese of Toronto in 2016. The dioceses of Toronto and Hamilton have shared a border since 1856. One of the responsibilities of the metropolitan archbishop is to call and preside over provincial councils. These assemblies of bishops are held to discuss ecclesiastical affairs and enact disciplinary regulations for the province. Toronto was a suffragan diocese of Québec until it was raised to an archdiocese in 1870. After being elevated to archbishop, Most Rev. John Joseph Lynch of Toronto called the First Provincial Council in 1875, which included Bishop Crinnon of Hamilton, Bishop Walsh of London, Bishop Jamot of Peterborough, and Bishop Duhamel of Ottawa. In the 1880s, both Ottawa and Kingston were elevated to metropolitan sees and provinces shifted accordingly. 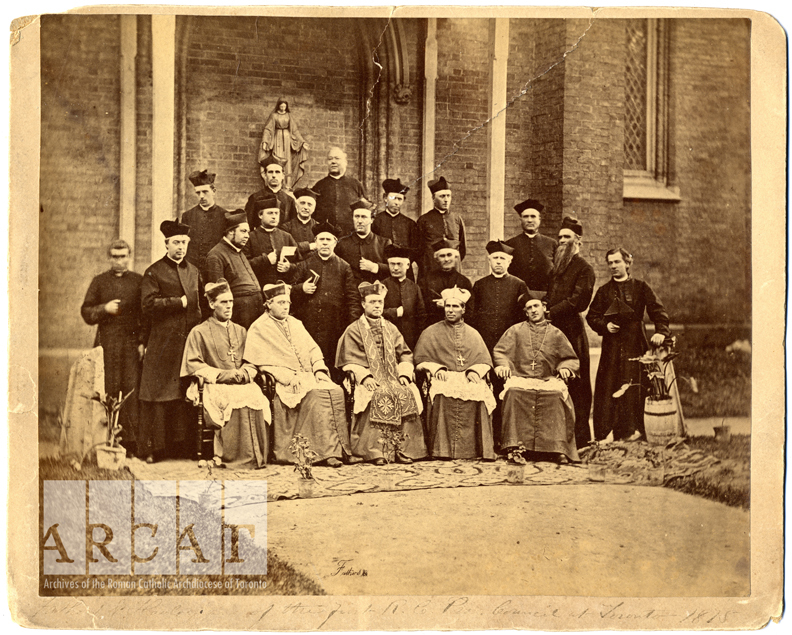 Photograph labelled "Fathers and Theologians of the first R.C. Prov. Council at Toronto, 1875." Participants of the First Provincial Council of the Archdiocese of Toronto, seated in front of St. Michael's Cathedral Basilica, Toronto. Seated, left to right: Bishop Crinnon, second bishop of Hamilton; Bishop Walsh, London; Archbishop Lynch, Toronto; Bishop Jamot, Peterborough; Bishop Duhamel, Ottawa. Toronto was raised to a metropolitan see in 1870, making Lynch an archbishop. The four other bishops represented the suffragan dioceses comprising the province at that time. In the 1880s, both Ottawa and Kingston were elevated to metropolitan sees and provinces shifted accordingly. The suffragan dioceses are currently Hamilton, London, St. Catharines and Thunder Bay. 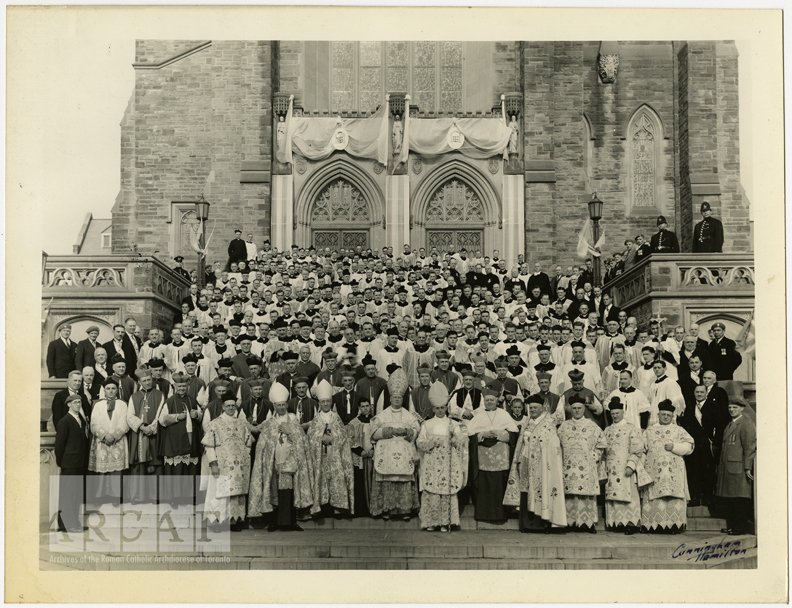 Bringing the focus back to Hamilton, we offer a great photograph from our holdings of the episcopal ordination of Most. Rev. Joseph Ryan, the sixth and longest serving bishop of the Diocese of Hamilton. And now we'll leave the blogging about Hamilton to our Hamiltonian colleagues! Group photograph on the steps of Christ the King Cathedral Basilica, Hamilton, at the episcopal ordination of Bishop Ryan of Hamilton, 19 October 1937. Front row episcopacy (wearing mitres) from left: Bishop Joseph A. O'Sullivan of Charlottetown and Bishop John T. Kidd of London (principal co-consecrators); Bishop Joseph F. Ryan: Archbishop John T. McNally of Halifax (principal consecrator). Archbishop James McGuigan of Toronto is right of Archbishop McNally.